COMPETITION forces companies to keep prices low to attract customers. But if a few firms become powerful enough, they can see off competitors and charge more. A new working paper by Jan De Loecker of the University of Leuven and Jan Eeckhout of University College London presents evidence that this is happening across the rich world. The researchers examine markups—selling prices divided by production costs. At 1, products are sold at cost; above 1, there is a gross profit. 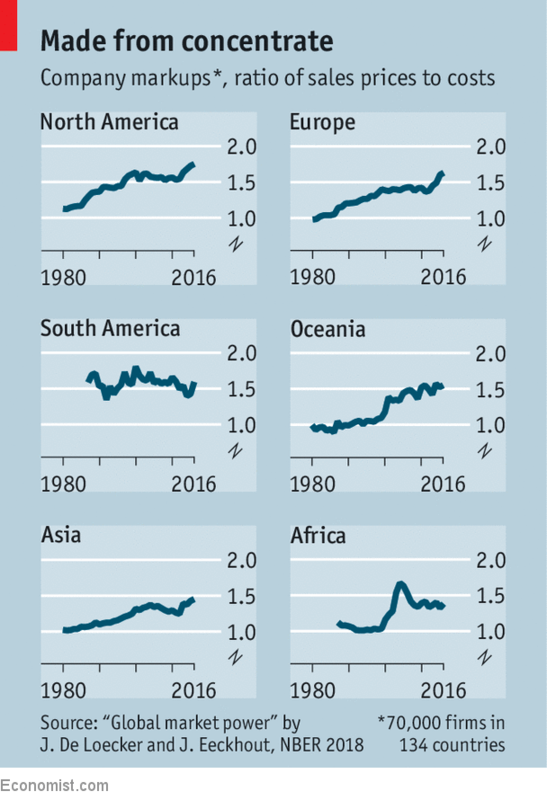 Using the financial statements of 70,000 firms in 134 countries, the authors find average markups rose from 1.1 in 1980 to 1.6 in 2016. America and Europe saw the biggest increases (see chart). But in many emerging markets markups barely rose. In China they fell. That suggests rich-world firms may have been able to increase markups by outsourcing to cut labour costs. Another possibility is that corporate concentration may have increased because of lax antitrust enforcement or the growing heft of companies benefiting from network effects, like internet firms. Policymakers should take note. Greater market power for firms may also mean less bargaining power for workers, and hence lower wages. A recent study by David Autor of the Massachusetts Institute of Technology and four other economists found that workers’ share of income in America has declined most steeply in the most concentrated sectors. A recent IMF working paper found that companies with relatively low markups invested more when markups increased, whereas those that had started with high markups invested less. This was particularly evident in highly concentrated sectors. And the ratio of dividends to sales was higher for companies with higher markups. Firms with greater market power, it seems, may not only have higher profits but innovate less.